Home care workers in Liverpool could soon be in line for a pay rise after the city council agreed to increase the rate it pays to their employers. From 1 April, service providers will be paid £15.16 per hour, up from £14.32. Cabinet member for health Paul Brant said the move, which would cost the authority more than £9m, was "a stepping stone towards enabling care providers to pay... better rates". The living wage is now £7.83 - 45p more than the national minimum wage. Councillors said the move was aimed at helping care providers "recruit and retain skilled staff" and improve standards of care in the city. Some payments will be back dated to 7 January. The decision was agreed following a consultation with organisations whose staff support about 11,000 people at home and another 3,500 living in residential and nursing homes. In a report provided to the cabinet, it noted how the improved fee rates "may make it easier for providers to recruit and retain skilled staff" which would have a "positive impact on quality and continuity of care for all service users". The increase will be covered mainly through council funding, with £1.9m of the total amount coming from government grants. UNISON assistant general secretary Christina McAnea welcomed the news but added that "those who can must ensure their money improves care and increases wages, not boosts care company profits". 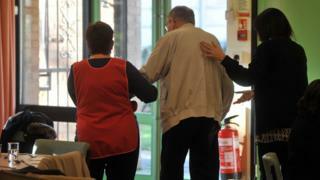 She added: "Councils must check regularly that care cash is well spent."